Whitewater Rafting on the St. Louis River near Duluth, Minnesota: The perfect adventure for large groups like bachelor and bachelorette parties, family reunions, corporate outings, schools, youth groups, and more! This trip takes you through a semi-wilderness area with rugged outcrops, tall pines, abundant wildlife, and challenging rapids. You will have an unbelievable time and will be so glad you decided to go “Swiftwater Rafting”!! Rates: We offer special rates for large groups of 10+. All of our discounts are off of the price of $50/person. Please be sure to include the total number of adventures in the contact form below. Arrive at 10am, 2pm or 5:30pm. There is no need to be early as we can not leave early. Check in begins at 10 am, 2 pm or 5:30 pm and outfitting begins 15 minutes after check in. My daughter and I had a blast whitewater rafting on the St. Louis River this past Saturday! 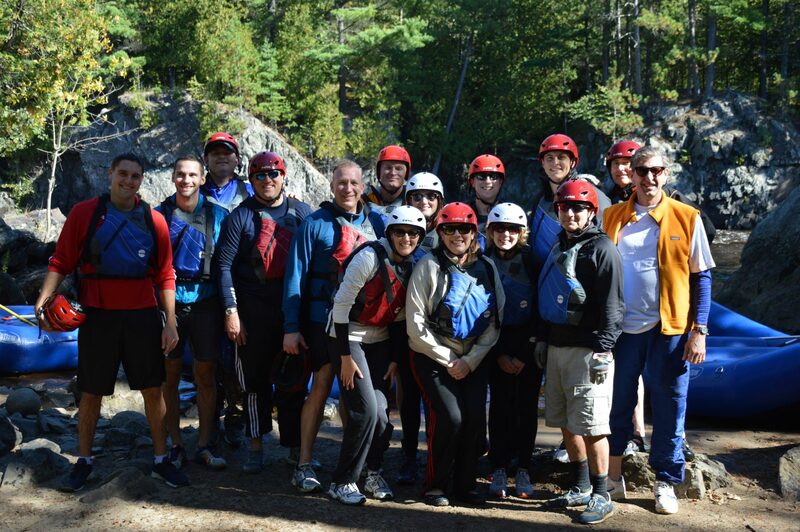 We’ve never been whitewater rafting before, but Swiftwater Adventures made it safe and fun. We’ll definitely do this again! Ready to get going down the river? Fill out the form below! You may also want to check out our Custom Adventure Trips.